Call them vintage or call them retro--but don't call them old fashioned! Vintage cuts, fabrics and graphics are all the rage in promotional t-shirts, and we're stocked with the latest styles. 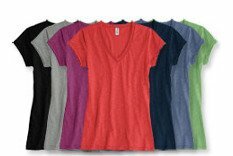 Our fashionable offerings ensure that your logo will stand out--and our eye for quality guarantees that our soft, durable tees will be worn again and again. Best of all, going vintage doesn't mean running with the crowd. Below are two unique ways to get with the trend. And if you need an idea or a sample, our promotional product experts are ready to help. <>or call 1-877-677-9988 to discuss your next project. You know how soft your old AC/DC concert t-shirt feels? Now you can have that soft, broken-in look and feel in a brand-new tee, thanks to the slub line from District Threads. This 3.39-3.7 oz. 100% cotton tee is woven with distinctive thick and thin slub yarns that gives the fabric a unique, vintage look and subtle texture. 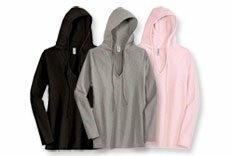 Its light weight makes it perfect for layering and it comes in a variety of styles for men and women, including a hoodie! Remember the 80s? Remember pink OP shirts? Bright colors and neons are also making their way back to the top and we've got some of the best, like Anvil's Chromazone Neon Tee. Constructed of mid-weight 5.6 oz. 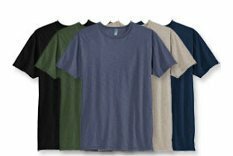 ringspun cotton jersey, the Chromazone is pre-shrunk for a great fit wash after wash.